Without the health hazards, alcohol consumption and smoking is a popular combo for those who want to unwind and relax. In fact, research shows that smoking and drinking work as a team—one makes you crave for the other. Party-goers know very well that these scientifically-proven health-damaging habits give life to the occasion. Quitting both smoking and drinking will make you miss out on lots of fun—or so they say. Since the invention of vaporizers, e-cigarettes, and e-liquids, fun-loving individuals who used to smoke and drink have been given a brand new, healthier way to unwind. The genius that e-liquid companies are, alcohol flavored e-liquids are now available to serve a dual purpose. Ex-smoker and ex-drinkers, or those who used to indulge in both, are now given the option to taste both substances in one single e-juice. Here is our list of the best alcohol flavored e-liquids for your reference. If you are a fan of the liquor that is flavored with potent green aniseed, then Mt Baker Vapor’s Absinthe is the alcohol flavored vape for you. Many vapers admire this e-juice due to its very close similarity to the real liquor, with a smooth flavor that is complemented with just the right kick. 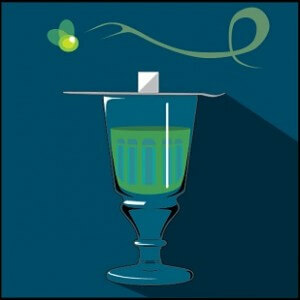 The Absinthe, although capable of producing flavorful vapor, does not have an overpowering anise taste. Rather, this aspect is mild and subtle, but distinguishable to compare to the alcoholic drink. Mt Baker Vapor offers this e-liquid in six nicotine levels and five VG-PG ratios. They also provide their customers with the option to get extra flavoring shots, depending on how strong they want their flavors to come out. A great all day vape or an e-juice for celebrating special occasions, the Jamaican Rum from Vista Vapors is one tasty alcohol flavored juice. The smell is very much like premium rum that will keep you vaping, of course, without getting drunk. Jamaican Rum does not only smell like the real beverage; it is smooth and flavorful as a blend of alcohol and molasses would. Most vapers who love this alcohol flavored e-liquid purchases with a 30 to 50% flavor boost to make their vaping more enjoyable. Nicotine levels are available in six choices. 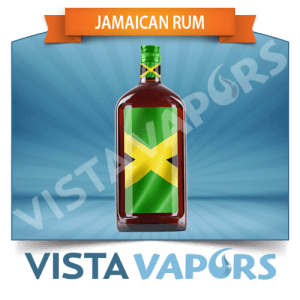 Vista Vapors offers the Jamaican Rum in 50-50 or 70-30 PG-VG ratio, or Max VG option. This flavor is also great when mixed with fruity flavors or menthol. 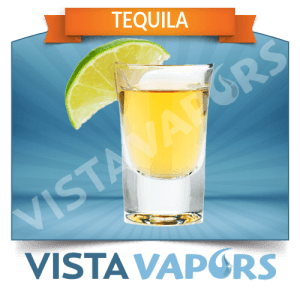 Another remarkable alcohol flavored e-liquid from Vista Vapors, the Tequila holds a sharp kick just like your favorite tequila shot. Even without steeping, this e-liquid comes out great, especially with 30% flavor boost. For those who want to get a stronger throat hit to make your vape more powerful, Vista Vapors offers a 70-30 PG-VG blend. Max VG is available for vapers who want smooth and rich flavored tequila vape. As a standalone flavor or when mixed with fruit blends, the Tequila is a great vape for those who want to unwind without the next-day hangover. Relaxing after a hard day’s work or giving yourself a toast to celebrate something? 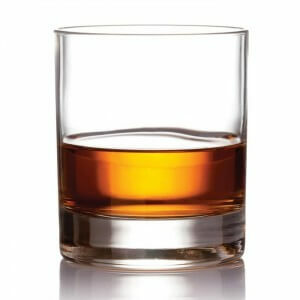 Turn the most ordinary vaping hour into a fine, happy hour by vaping Bourbon like the good old’ days at the bar. VaporFi has come up ith the Top Shelf Bourbon, which smells and tastes like the real American whiskey, only without the alcohol. Without being too harsh, the Top Shelf Bourbon brings the right throat hit and kick, while maintaining the smoothness anyone would want to have on their vapor. It has a subtle sweet and creamy undertone of vanilla that even non-drinkers would admire. VaporFi offers this e-liquid in two VG-PG blends, and three flavor strengths to choose. 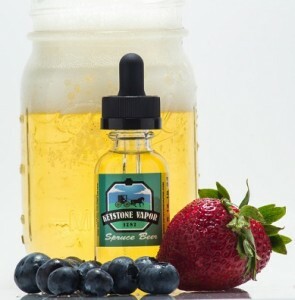 A ready-made mix of an alcoholic beverage and some fresh fruits, Keystone Vapor’s Spruce Beer is fun, bubbly, and a light alcohol flavored all day vape. This e-juice is available in 30-70 or 50-50 PG-VG or Max VG blend for smoother and thicker vapor. Unlike other alcohol flavored e-liquids, the Spruce Beer is a great blend of spruce beer flavors, strawberries, and blueberries. While it has a mild kick on the inhale, the overall taste of this e-juice is perfect for those who want some subtle alcohol tang in their vape. 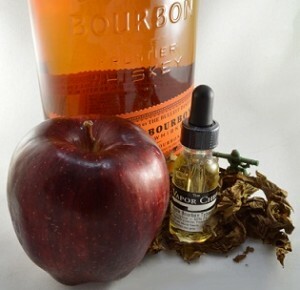 From one of the makers of the tastiest e-liquids on the market today, the Apple Bourbon Tobacco is a rich and sweet vape that is mixed with genuine bourbon flavors. This e-juice is perfect for those who want to end the day with some whiskey vape, or those who want to vape while taking a sip of their bourbon without the flavors interfering with each other negatively. As with other e-liquids from Vapor Chef, the Apple Bourbon Tobacco is professionally blended with the right amount of every ingredient. So far, these are the best alcohol flavored e-liquids that belong to brands that we have reviewed in the past. There are plenty of other flavors within this category, and we will make sure to provide our objective review of each one soon. 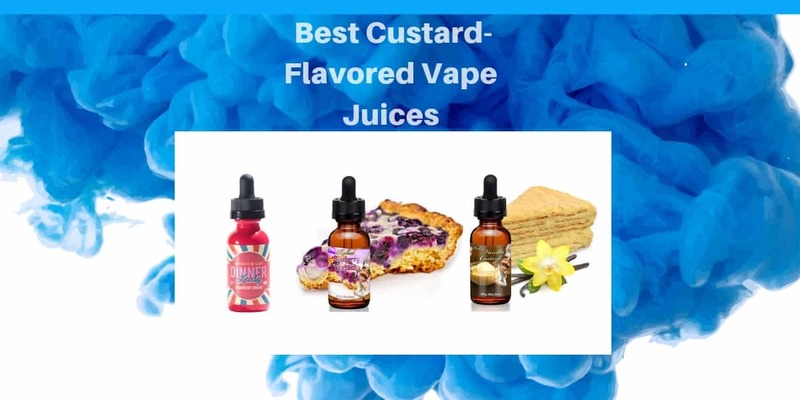 Custard e-juice is what happens when old meets new. Here's a taste of the best custard-flavored e-juices out right now. Looking to buy cheap menthol e-liquids? Then read this article to find out which top-rated menthol-flavored vape juices are worth your time. Are you up for spiced vape juices? Check out your top options by reading our Best Spiced Vape Juices article. Have you just quit smoking cigarettes and looking for your type of e-liquid? Check out our list of the best tobacco-like vape juices and find your ADV now. Favor fruity flavored e-liquid? Check out our list of the best fruity e-juices available on the market today.